Summer CHA is over and I'm back on deck again... well almost. So until I settle back into routine I thought I'll share a couple of cool make and takes I did at CHA. This first one is just so stunning and yet unbelievably simple: it's a way cool ring made using coordinated buttons from Blumenthal Lansing. These are from their new line called Coordinates and they come carded so all you need do is select your look and stack the buttons together. Add a few beads and your done. It's all tied together with plastic beading thread and then hot-glued onto a ring base. I think the hardest part of making this ring was selecting one of the fantastic button cards. Coordinates are not up on their website yet but if you're interested in this one, it's called Starburst. Look out for another make and take later in the week. Did you notice I'm sporting a new look today? Yes, I've shed my old blog skin and emerged with a brighter, fresher look. Same colours as before but just a brighter version..... a breath of fresh air to keep the winter blues at bay! And whilst I've been thinking fresh this week, I decided to pull out my Plaid Fresh components and get creating. 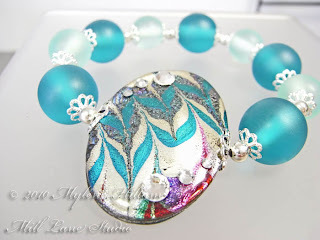 I've liked this line for such a long time: it includes a wonderful selection of graphic pendants, coordinating resin beads, coloured cords and brushed silver charms. The brushed silver components and brightly coloured beads lend a really, well, fresh feel to the range! For this necklace I've used a pendant, word charm and chain from the range. 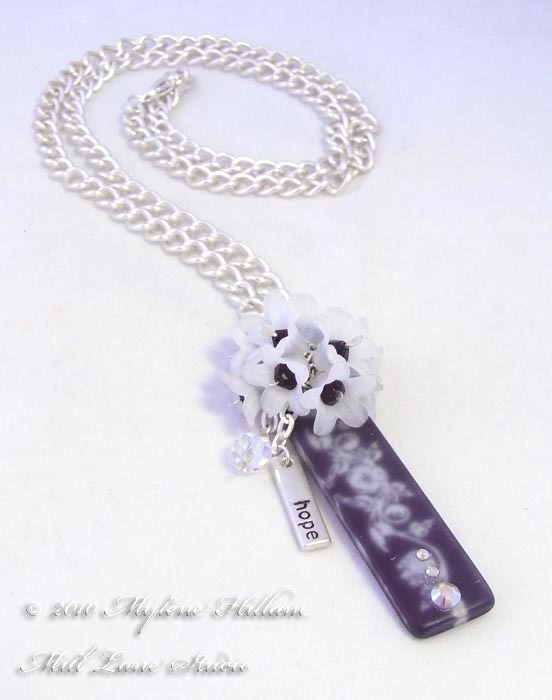 The posie of frosted white lucite flowers with black Swarovski crystal beads for the centres adds a touch of elegance to the necklace. Black, white and silver ......... so stylish and so FRESH! Well, it's just 9 sleeps until the Stamp Antics Retreat and kit preparation is in full swing. I've been burning the midnight oil for the last few nights making sure I've prepared all the handmade components ready for Jenny and the girls to pack into the workshop kits: the eggs have been moulded, the metal shim has been alcohol-inked and the the Dymo labeller has been working overtime punching out word strips. My poor little fingers are feeling the effects of rotating the dial backwards and forwards! I can't wait to share the project with you........ but, it wouldn't be much of a surprise if I did. What's that I hear? You want to see? You can't wait until Camp to find out what we're doing? Well OK...... you've twisted my arm. But it's only a teaser to whet your appetite for more! This little guy sits in the corner of the project protecting his nest. 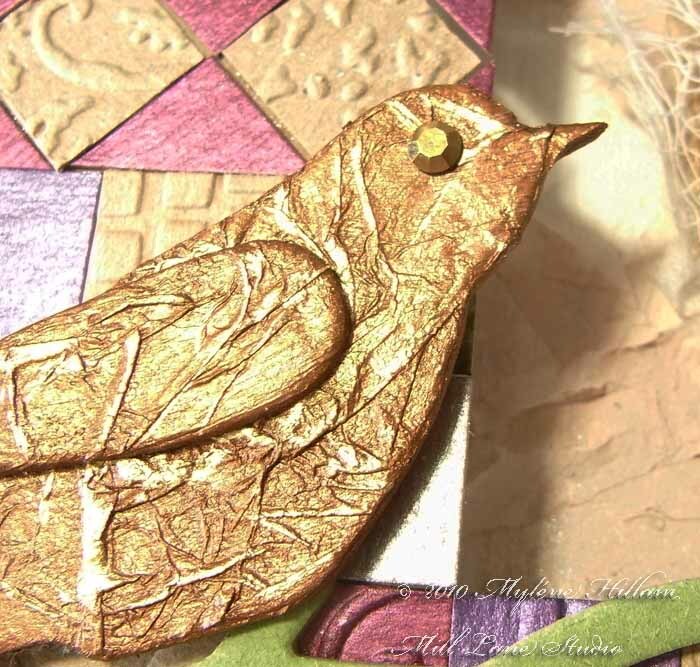 And as you can see, we'll be working with two of my favourite things: Lumiere Paints and a Krylon Gold Leafing Pen. OK, that's enough of a sneak peek.... no more looking or you'll spoil the surprise! But I promise, you won't be disappointed. Be warned though - this project is full on and I will be cracking the whip to keep you on track. Nah, not really. If you've done any of my workshops before you'll know I'm not like that at all. You'll work at your own pace and if you fall behind I'll be there to help you along. Or, there are always the instructions to fall back on. Last weekend, I got to spend a whole day at the Bead and Gem Show in Brisbane and I can't tell you how much of a treat it was. I love talking to people who share my passion for beads, findings and stringing materials. It was such a pleasant way to spend my day off. But of course, I didn't go to the show just to chat to people.... I was on a shopping mission! I found a whole range of great tools for my jewellery studio - tools which I didn't even know that I needed until I saw them! But as they say, you can never have too many tools and I promise that I will play and experiment with them. No doubt they will add another dimension to my work. Amongst the wonderful array of beads and findings on display, I was hoping to find some glass pearls and crystal dangles to suit one of my marbled Friendly Plastic cutouts but I left it behind in my studio - not very helpful! It's really hard to "remember" exactly how a colour looks and our minds play funny tricks on us. We remember it as being darker or lighter or sometimes we pick the wrong tone altogether. Colour matching from memory is something I don't recommend - too often I have come home with the wrong colour beads, despite having a good sense of colour. But this time my memory got it right - light olive pearls and dark olive crystals in just the right shade! 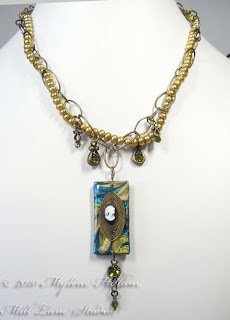 I've teamed them with a vintage-inspired brass chain and an unusual cameo, both from Vintage Groove by Making Memories. I love how this piece is so contradictory - it is neither modern nor vintage..... and yet, it is both! The colours are modern and yet they're not; the cameo is vintage and yet it's not. Contradictions! This is one of the wonderful things about Friendly Plastic; add a bit of sparkle and it will complement the bright metallic foil. Or tone it down with some aged brass and it works equally as well. 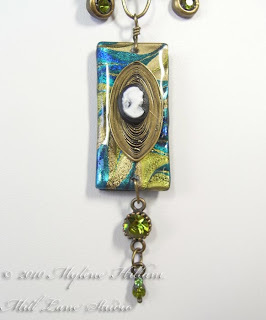 Or do as I've done with Lady Olivine and use them together to create a modern vintage effect. Eye Candy - so simple, so sweet! In a recent post, I shared with you how I prep my marbled Friendly Plastic cutouts ready for jewellery making. And yesterday I finally had some time to transform those demo samples into pieces of jewellery so that you can see how your marbled cutouts can be utilised. So, today it's candy time..... some super easy and sweet ideas to turn your marbled Friendly Plastic into gorgeous jewellery! 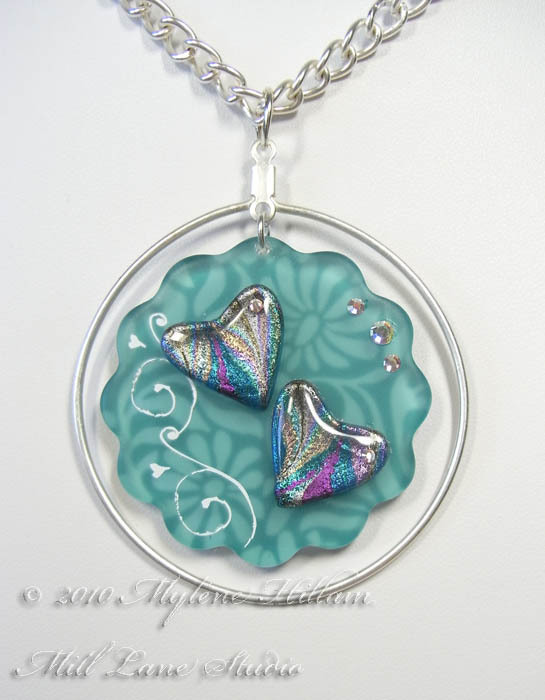 First up, a simple pendant hanging on a chain. For this piece I've used findings from Plaid's Fresh range: a petal shaped pendant, a circular frame and silver chain. Plaid has done all the hard work here as these components are designed to work together. 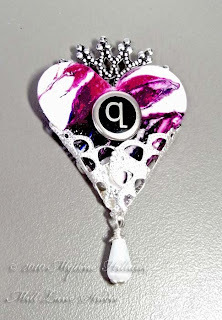 To personalise the piece, I added some white rub ons and clear crystals to give it some added interest and complement the Friendly Plastic hearts without overpowering them. The second piece was a lucky find. This bracelet watch (minus its workings) was the perfect size for the small oval cutout - it just snapped into place as if the two were made for each other!! The pink crystals on the bracelet tone perfectly with the mauve Friendly Plastic. This is upcycling at it's easiest! To achieve the colours of the third piece, I marbled white Friendly Plastic with alcohol inks. Then I wrapped the heart cutout in a square-shaped silver filigree stamping. 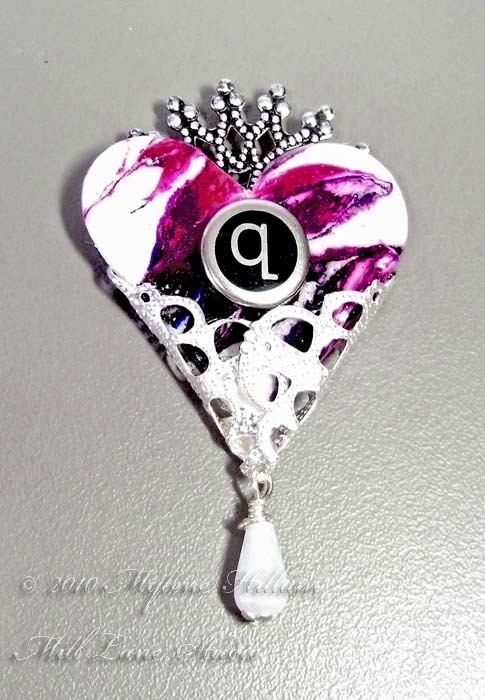 The little crown is a round filigree stamping which fitted perfectly behind the heart. I haven't decided whether this piece will become a pin or a necklace yet. And the last piece for today is a stretch bracelet. This oval has a front and a back to sandwich the elastic between the two layers and hold it securely in place. To do this, place one piece (resin side down) on your workspace. I prefer to use a non stick surface just to be on the safe side. Use a heat gun to soften only the top. Lay a headpin on the melted surface and press it down into the plastic. Lay the second piece down on top (plastic sides together) lining it up perfectly. Gently press the two pieces together. When cool, remove the pin and thread through the beading elastic. The beads in this piece are also from Plaid's Fresh range and they coordinate perfectly with the turquoise and silver marbling. 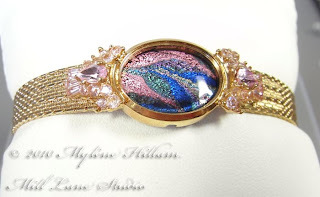 The addition of a few silver bead caps and some crystals for bling make this a really pretty bracelet. Well, that's it for today! I hope you can see how easy it is to take a marbled cutout and turn it into a piece of unique jewellery. 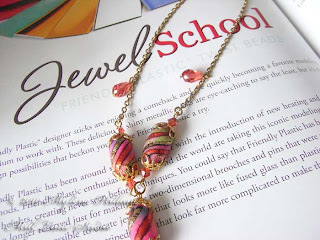 Perhaps you'll be inspired to turn some of your Friendly Plastic creations into your own original pieces of jewellery! Right now I'm gearing up for more Friendly Plastic demos on Thursday at the Bribie Island Community Arts Centre so I'll have more samples to share with you later in the week. Did I ever tell you that I love making beads from Friendly Plastic? I probably have! But have I ever told you that I love making Twist Beads? Yes, I've probably told you that too! Twist Beads are one of the staples of my Friendly Plastic demonstrations and they're a favourite with everyone who sees them. They look just like striped candy.... only without the calories! And yes, they do look good enough to eat! But whilst they look difficult to make, they are deceptively simple. It takes just a few simple steps to turn a strip of Friendly Plastic into a fabulous twist bead. Want to learn how to make them? 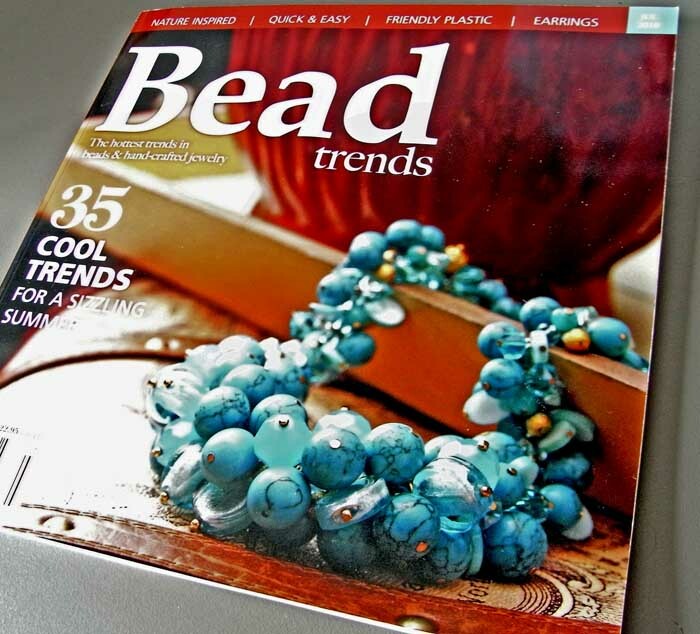 Then check out the July issue of Bead Trends magazine which features one of my Twist Bead creations in Jewel School. The article is complete with instructions and step-by-step photos from start to finish. This issue has already hit the newsstands in the US and will be on Australian shores very soon. Ask your local newsagent to get a copy in for you and then have a go at making your own colourful candy - minus the calories of course!